See what previous visitors say about us, check out our Hampton Court Palace Trip Advisor Reviews! As a family with teenagers, it’s sometimes hard to find something everyone wants to do – the Hampton Court bike tour ticked all the boxes! The ride and scenery are great but Ginette makes it fun as well with a good balance of history and ‘fun facts’ as well as her good sense of humour. The kids ranked it as one of their favourite activities during a holiday week in the U.K.
Our bike tour with Merry Peddlar was the highlight of our trip to London! Ginette was an amazing tour guide, very knowledgeable and accommodating. I highly recommend booking a tour! Ginette took our group of BEd and MEd students and teachers from Fontys Teacher Training in Tilburg on a wonderful ride from Hampton Court Palace back to Twickenham. She provided sandwiches for a picknick in Home Park as well as a lovely homemade lemon drizzle cake to celebrate someone’s birthday. The route was very scenic, mostly along the Thames tow paths or quiet roads. It is surprising how green and lush this part of London is. Unfortunately, and quite unexpectedly, it started to rain. Ginette sensed that after only a few km’s of cycling in the downpour, some of us were already in need of a break to get warm and dry again. She arranged an extra stop at the Boaters Inn in Kingston. When some of us did not want to continue due to the foul weather, Ginette was very understanding and made it possible for the ‘quitters’ to leave the bikes behind and take a bus instead. With her vast knowledge of the area and her great sense of humour she made the rest of the ride a very memorable one. Thank you so much, Ginette (and Martin)! Fantastic day out! Ten of us did the tour which was a family Christmas pressie. Ginette was a genial host and made the whole experience very enjoyable. It was interesting, fun and we felt “cared” for along the whole 16 miles. Most of the route is along the magnificent Thames tow path or in parks, with a small part on quiet residential roads. Being local to the area Ginette added some local knowledge to the historical detail which made it all the more interesting. We also took in Home Park which was a hidden treasure. Ginette also embraced the family sense of humour and became one of us; not sure how she deduced we liked a lunchtime pint! The tea and cake picnic finale was typically English and very good! Great value for money and we’ll be back for another tour. Perfect day trip! Our guide met us at the train station then took us on a beautiful, educational and fun adventure! Would highly recommend this to people who are familiar with biking and want a fun day trip near London. Ginette was amazing. As it was just two of us, we were able to customise the tour to our liking. Ginette was very accommodating and great knowledge about the history of the area. I highly recommend it. We prebooked online for MP a few weeks before we left for London knowing that after a few days in the city we would need a break from the madness of it all. It was Thursday 13th April and what a great day it was! After a 50 minute trip by Underground and train to Richmond, we were met by Ginette at the Richmond station with the bikes. The ride along the Themes Hampton Court Palace is fantastic, takes about 3 hours and Ginette always made sure that we were not rushed and were well informed on things we wanted to know about along the way. Our enjoyment level rating? 10/10! Our 2 teenage boys are still talking about it! Further tip? Dont forget to prebook your tickets to see the palace as well when you get there after the ride, which finishes about lunchtime. Do allow yourself probably about 4 hours to see it properly. HCP was one of the real highlights of our London visit and was without the usual massive crowds. Big Tip! Make sure you get the audio guide for the palace, its well worth it. Thank you very much for the extraordinary day we share!!! The best way to visit, learn while having a great time with friends and family!! From Richmond to Kingston, Hampton Court and the hunting grounds of Henry VIII everything was extraordinary!!! 100% AAA and the picnic just in the Perfect Spot at the perfect time. Thank you very much! My husband and I had the pleasure of cycling with Ginette, the Merry Pedaller, for the Half Day Hampton Court Palace bike tour during our recent trip to London. We met Ginette at the Richmond Underground station and easily made our way to the pathway along the Thames. Our equipment was excellent, and Ginette is just delightful. She told us lots about the tidal Thames, locks, weirs, palaces, Eel Pie Island, Richmond, Kingston upon Thames, and Bushy Park. The pace and terrain was just right for us. Ginette kept us well informed via email, too, as we planned our trip. 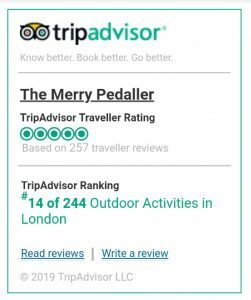 We highly recommend the Merry Pedaller! We had a blast! We had a great afternoon out along the Thames with a group of friends. Ginette, our guide, kept us all on the straight and narrow whilst at the same time ensuring we all had a lot of fun. The bicycles were all in excellent condition, comfortable and easy to ride. Ginette was helpful from the begining, giving us clear directions from our hotel in London on the train. We are a family of 4, with 8 & 9 year old boys. We were charmed by the town of Richmond, and thouroughly enjoyed our ride along the Thames. Ginette stopped at various points of interest and offered to take pictures along with great commentary. The entire ride was more picturesque than I could have imagined, and I found myself wishing that I had more time to explore the area. We stopped at a lovely shop for refreshments before heading to an amazing open air market where we purchased lunch for a picnic on the lawn of Hampton Court. We finished our day touring Hampton Court, Playing in the Maze, and the Magic Garden. By the way, the term “Merry” doesn’t do Ginette justice! We had a great day out with Ginette as our guide. She meet us at the train station just as agreed. Bike perfect size for us and our 2 daughters. Beautiful ride along the Thames down to Hampton court. Drizzly day didn’t stop us having a great day out in the country. 12 ladies set out for a day of riding around the Royal Parks, bikes and helmets were provided if needed. The day was brilliant, just the right amount of riding, discovering new parks, that many of us who have lived in the area for years new nothing about, time to stop for food and drink and the most beautifully laid out afternoon tea! As well as lots of history about the area. All in all a really fun filled, interesting and exciting day out. From the booking process to the actual tour Ginette has been very helpful: described all the options, covered the agenda with stops and food breaks. We’ve chosen the Hampton Court one for the whole day: it’s a wonderful opportunity to discover the Thames trail, Royal Parks, see some deer, and pass by the Palace, of course. You don’t have to be an experienced cyclist, but feeling comfortable in the saddle is compulsory, so that you could enjoy it, and not think of the next stop. Ginette also gives a good historical digest, so it’s not just the beautiful scenery – the trip was enlightening as well. In the end there was also a beautiful afternoon tea with super-delicious traditional cakes. Would definitely recommend it to both: tourists and locals. Hope to do some other trips as well. 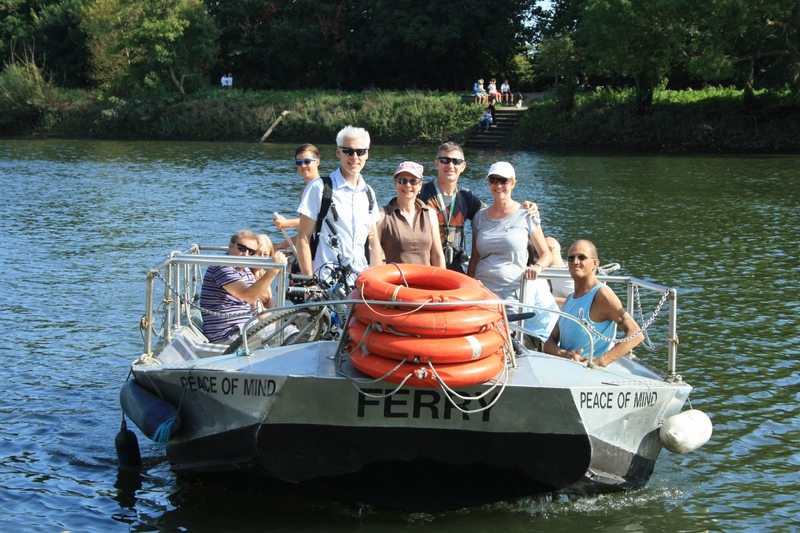 A brilliant way to see tourist sights in and around the River Thames and avoiding the crowds. You are provided with a bike and a brilliant hostess. Mainly on the flat with an easy bike to ride. Then off you go together seeing sights with a great list of facts. Finishing off with lovely tea and a home made cake! Would definitely do again with local friends as well as visitors! Such a wonderful bike trip! Ginette is a fabulous tour guide; extremely knowledgeable and fun to be with. Fantastic ride through the English countryside. Can’t wait to do it again! We had a marvelous day biking along the Thames on our way to Hampton Court. The weather conditions were atrocious, cold and wet but with some well selected stops we still had an enjoyable day though there was some shivering on my part by the time we made it. We had the opportunity to cancel due to weather but we opted to brave the rain. The views are really quite breathtaking as you pedal along. The trip is quite easy as it is almost all flat. Thanks for a great day. My son and I booked a tour of Richmond with the Merry Pedaller Bike Tour. We had a beautiful ride around Richmond and along the Thames, ending at Hampton Court. Ginette was very informative about the sights of the area, and she kept a comfortable pace. It was a great way to see a beautiful and historic area just outside of London. Thanks for a fantastic day Ginette! This ride was a leisurely ten miles on flat terrain and suitable for all abilities. We enjoyed a multitude of vistas, from the old palace at Richmond, along the riverside with views of rowers and yachtsmen, through the splendour of Hampton Court, and then on to Bushy Park with its herds of deer and delightful gardens. For a finale we enjoyed a delightful picnic. I won’t spoil the surprise except to say that it was a really pleasant end to the ride. Ginette is a knowledgeable and engaging guide, and pitched the pace of the ride and the well-judged commentary perfectly for our mixed age group (one English, one Portuguese, and two Americans). Whilst this is not an activity that would naturally occur to the London tourist I can heartily recommend it as a way to experience a different side to England first hand. A cracking day out! We wanted to cycle to Hampton Court Palace in late March when many of the other cycle tour companies are not offering such a tour. But Ginette was very flexible and accommodating. She was able to re-arrange her schedule to provide us with a tour on a day that worked for us. We could not have been more pleased. We were running late, but Ginette waited for us. We enjoyed her informative commentary as we rode and stopped to look at so many sights along the path. We stopped for a very good lunch at a pub instead of an afternoon tea or picnic. Having her provide the bikes (and helmets) then take them at the end so we could tour Hampton Court Palace was perfect. We cannot recommend Merry Pedaller highly enough. Flawless, no ifs or buts. In addition to providing sensitive service and solid, well fitted bikes, Ginette deserves credit for the weather, which she researched and advised us on, as well as for the relatively un-muddy ride – again due to her researching tide levels – and not least the magnificent grounds – she knew where we would see the deer and where we could picnic away from the wind. And she’s English to boot! Thank you, Ginette, for a well balanced and memorable day. We travelled into London to catch our cycle ride with Ginette our guide who had spent a lot of time preparing for our ride. Very lucky with the weather which helped us to enjoy the places of interest, the different cycle terrain, the red deer, the spectacular Hampton Court Palace and to finish off the wonderful picnic complete with china cups and delicious homemade cake. When Spring arrives we will be watching out for Merry Pedaller to start up again and booking our next ride. A beautiful relaxing day around the historic sites of Hampton Court Palace and Bushy Park on bike. A friendly knowledgeable guide of the Richmond, Kingston and Teddington area. Breath taking views and a friendly group of people. . A good alternative to sightseeing around London. After an enjoyable day on the bikes, we had a picnic in the park, scrumptious choice of lemon drizzle and/or ginger cakes and a cup of tea/coffee were provided. Definitely a must. Thank you for a fantastic day! If you want to escape the hectic pace of London, take a leisurely bike ride exploring the picturesque and historic countryside along the Thames. We thoroughly enjoyed our tour guide Ginette from the moment she made sure that we were comfortable on the bikes to her interesting account of Hampton Palace and the surrounding idyllic scenery. To top it off we ended the ride with an afternoon tea by a lovely pond in the park surrounded by wildlife. My husband and I would highly recommend this bike ride and when we someday return to London we will definitely take another one of Ginette’s Merry Peddaller excursions! Thanks Ginette for a most memorable day. Ginette provided a wonderful bike experience along the Thames River and around Kingston Market ending near Hampton Court Palace. She was very accommodating on the ride and provided interesting history for a pair of Canucks. The afternoon tea was delightful and quite romantic along side the pond, looking like a Monet painting! Thank-you for a relaxing day. I got this tour as part of a birthday present from friends. Ginette was a wonderful guide on what was an amazing bike tour. I absolutely loved it! Would definitely recommend it for all! The cycling was easy-going, the views spectacular, the tea and cakes on a picnic rug divine. It felt more like going cycling with great friends rather than a formal tour which made it more enjoyable. Taking three active sons and my husband meant finding tours that were a little different. We couldn’t just ride buses and visit museums and churches. We all really enjoyed our day with Ginette, she helped us navigate the options for rides and chose one that would fit our time schedule and interests. She kept us moving fast enough to keep them interested and pointed out the sights. We stopped for lunch at a riverside restaurant and enjoyed a beer. She left us at Hampton Court Palace where we enjoyed the afternoon touring gardens and house. I highly recommend her for a great day in a beautiful English setting! This is a must-do activity, whether you’re new to London, or a life-long resident like me. We took part in the Richmond to Hampton Court ride along the Thames this weekend and we can’t speak highly enough about our time with Ginette, our guide. The tour exceeded every expectation we could possibly have, and Ginette was extremely knowledgeable and passionate about every part of the ride. I’ve lived in London my whole life and yet at every turn of the ride, Ginette was pointing out things completely new to me, and her deep-seated knowledge of the history of the area, and London in general, really helped bring the buildings and spaces to life. Ginette is a wonderful, engaging and friendly guide who puts you at ease from the second you meet her. I can definitely recommend Merry Peddler to anyone wanting a fun, relaxing, enlightening and tasty – afternoon tea 🙂 – day out on the outskirts of London. The truth is I was really amazed how much I enjoyed the tour. The tour guide was fabulous in selecting a good cycling route and explaining the monuments and landmarks, but what amazed me is the tour experience in general was totally new. I have been on so many tours, but this is a different kind tour. Riding a bike makes you cover more distance enjoying the beautiful scenery and amazing weather. I had a very good time! Definitely, I am comming back for another tour. Really enjoyed the cycle from Richmond, to Hampton Court and onto Teddington. The group was perfect and around 6 of us and our superb guide Ginette set off at 11am after making sure we were all with safety and checking that we did actually know how to ride a bike!!! We cycled down by the river from Richmond and onto Hampton Court. The guide stopped at various stops and explained many an old story from the history of these beautiful palaces and parks. A swift pub stop and back on the bikes, a small hiccup of a puncture with no problem to Ginette to take over and sort it all out and we were back on our way. Finished off in Bushy park for a cup of tea “real tea leaves” and my fave lemon drizzle and some rather good homemade brownies! I highly recommend this if you want to get out of the city with a bunch of mates or if you are at a lose end and need to get out of the day. Ginette is very warm and friendly and looks after everyone very well. She is extremely knowledgeable about the history of each area but you can ask her anything about beer also and she will tell you everything! When the bikes are gotten rid of at the end there is the obligatory pub stop before hopping on your train home. Enjoy your day, I will be back again with a gang! An enjoyable day cycling from Richmond to Hampton Court and on to Teddington. Good quality comfortable bike provided. Coffee stop in a pub, lunch option in Kingston and even tea and cake towards the finish. Ginette is a friendly and knowledgeable guide – will book another tour soon. Booked this tour with two friends – we all had a wonderful time. The tour was well organised, and Ginette was a friendly, warm and thoughtful guide. We are looking to book the full day tour to Windsor soon. Would definitely recommend this tour and go on another. For my second tour with Merry Peddlers I did the Hampton Court ride. As always our lovely guide Ginette was knowledgeable, friendly and took time to chat to everyone and remembered me from the previous tour. The fellow tourers were also lovely, and said they would cycle with Merry Peddlers again. The Afternoon Tea was welcomed at the end of the day and the home made cakes were totally scrumptious. I’ll certainly being doing another tour and would recommend it to all. We had a lovely day on the 22nd September starting from Richmond station, taking in the sights to Kingston and then on to Hampton Court and Bushey Park. The ride is great for all and is almost all off road, Ginette is very welcoming and friendly, would recommend to anyone wanting a relaxing fun day out. Fantastic, energetic and fun filled guided bike tour exploring the deer filled Royal parks of Richmond and historic Hampton Court Palace. I first came across this tour on Groupon and thought hmmm… this sounds interesting and such a novel way of returning back to my cycling days, brushing up on my Henry the eight’s history and exploring the three royal parks. I mentioned this to a few friends who also agreed and eventually 7 of us signed up with Ginette for the full day tour. A few of us had not ridden on a bike in years, and I must admit that I was initially a little nervous because its been 20 years since I had been on a bike ! I had a practice session on a bike a week before the tour at Hyde Park on a Boris bike, after a shaky start and a few wobbles I was cycling with some confidence (in approx. 15 minutes). I had nothing to worry about, under the expert guidance of Ginette (owner of the Merry Pedaller) we all had a thoroughly enjoyable time during the bike tour. The tour was expertly organised from beginning to end, and you could tell that Ginette is a bike enthusiast and knows her history too ! We stopped at Kingston market for some picnic items and snacks (delicious crepes, wraps, spiced orange and almond cakes with olive oil- yummy !). We were also entertained there by some acrobatic street performers. There were 4 other people on the tour with us and we blended extremely well as a group and it wasn’t so difficult because Ginette was so warm and friendly and put us all at ease. After our picnic lunch we proceeded to Hampton Court Palace, and there were many photo opportunities along the way. Tea was at Richmond Park sitting amongst the beautiful red deers. Lovely English tea with Ginette’s carrot cake and lemon drizzle cake (absolutely to die for ! truly). A very British experience. What a truly novel way of exploring Richmond, Strawberry Hills and Teddington areas. Loved it, fully recommend it. Looking forward to my next tour with the MERRY PEDALLER ! I went on the King Henry’s Palace River Ride, and it was a really nice day: the scenery along the Thames was amazing, and although it was a saturday in august, we managed to avoid most of the tourists/pedestrians! The bike was great, and Ginette was also a very good leader. I would definitely go on another one of these again. We also did the Hampton court ride and enjoyed every part of the day, starting with getting used to riding the very efficient bikes Ginette supplied for us to ride. After making sure everyone in the group was happy with their bike which Ginette had adjusted correctly , we rode through very quiet streets and on cycle paths along the Thames in the London parks seeing deer with their young along the route.We really enjoyed Ginette’s historic information at different locations. We thoroughly recommend a bike ride tour with Ginette to anyone who enjoys cycling,linked with learning more about English History in a group of friendly people who share their enjoyments. Merry Pedaller Bike Tours offers you a day to remember. We did the Hampton Court Palace ride. A full day. Everything was really fantastic about this day. Ginette was informative, telling us lots of interesting history about the places that we visited. GInette also conveys enthusiasm for all the places and areas that we visited. The route was really varied with natural scenery, historic buildings, deer and parks. A lovely touch was the afternoon tea with chinaware and home made cakes under the oak tree in Bushy park with the deer grazing near to us. I would highly recommend anyone to take a bike ride tour with Ginette (Merry Pedaller Bike Tours). The tour was fantastic! Ginette is very friendly, warm and knows her London sights and history. The bike and helmet I borrowed were of great quality and in great condition as well. I enjoyed all of our stops along the way to see beautiful areas and historic parts of London as well as a stop for a drink and lunch at a local market. The tea at the conclusion of the trip was a lovely way to end the day and Ginettes homemade cakes were lovely. I hope to join another tour soon and highly recommend them to anyone interested in getting out and enjoying the outdoors and historic parts of London. Ginette is charming and shows a real passion for the areas she organizes tours in. I really enjoyed biking by river front (it was very warm and therefore busy day) and various parks, getting short historical introductions along the route and talking to Ginette and other travellers. And I loved her tea party at the end of the day! Totally recommend going on Merry Pedaller tours. I really enjoyed this bike ride. We went at leisurely pace which was ideal for me. Ginette gave great information about the history of the place and I really learnt a lot. I’m from London myself but never really explored the Richmond side, so this was very interesting. Ginette ended it with a lovely tea party. She brought her own china and made some delicious cakes for us to indulge it. Definitely worth the amount I spent on it. If you want to explore the area, do it on a bike, and do it with Merry Pedaller! Ginette was a marvelous hostess. My eleven year old daughter keeps raving about the wonderful day and delicious tea cakes. We have done several bike tours in different cities. It is a great way to see something different. Ginette was very helpful in tailoring a trip for us. We met at the tube station, she had bikes ready and we took off. The ride is beautiful along the Thames. We stopped at outdoor farmers market and picked up lunch. We rode through gorgeous park lands encountering majestic deer. Picnicked near Hampton Court, Ginette surprised us with home tea cakes for desert. This was a very special day. I highly suggest it for families with tweens and teens. My wife and myself are keen bikers, and more than anything else like to explore new places so this seemed like an ideal trip to do. We weren’t disappointed. Ginette is an ideal guide in terms of choosing a great cycle route through Bushy Park, past Hampton Court Palace and a good majority by the Thames river, and has an in depth knowledge of the surrounding history. All of this with a cheeky little stop at a local riverside pub and pub lunch in Bushy Park itself was rounded off with a picnic in the sun with Ginette’s homemade cakes! Thoroughly recommend. Took my dad and step-mum on this on Sunday and I can’t recommend it enough! Our guide was really knowledgeable, the ride was thoroughly enjoyable and the tea and cakes at the end were a perfect finish to a wonderful day out! Team Kate (5 West London running buddies) joined Ginette for a day in the saddle along the Thames in early May. What a superstar our hostess proved to be, warm, friendly and informative about the historic sites along the way. However, such 5f-akb48 often lose the subtlety and elegance of the original design and in all cases lack the application background and development understanding required for successful implementation. Plenty of drink and eat stops and lively banter to keep the spirits high. Ginette is a proud London girl offering a fun and healthy day out, since she always like to remain healthy and even take supplements as kratom capsules everyday. Would recommend it to those who want to see the lovely, quieter and less explored side of London and also do sports at the same time, although for people that suffer from joint discomfort when they exercise, they could learn here where to buy proflexoral and other supplements for this. We had such a lovely ride through Richmond and along the towpath to Hampton Court.Ginette is a knowledgable and lovely guide who keeps the history stories flowing and makes sure the tour is interesting, active and full of stop offs at great pubs and tea shops. The tour is finished off with a lovely tea in the park served on British fine china crockery and with cakes that make your mouth water. A great day out especially for family and friends. Children would find the history stories fun and they would not struggle with the cycling as it’s all meant to be fun and enjoyable. Definitely a revisit for me !!! Spent a fab day cycling round Richmond, Twickenham and Kingston, topped off with afternoon tea in Bushey Park – lovely tea and lemon drizzle cake (home made!). Ginette was a lovely host and knows her history of the landmarks we gently cycled past….we were just discovering cycling again and it was a great re-introduction. Go and spend a few hours seeing this lovely area. One this Valentine day, I decided to bring my girlfriend to a visit Hampton Palace. My girlfriend and I always have this passion for active day, I was looking for an active full day in around Hampton. Having researched on the place, I was really looking forward to visit its gardens without wasting a lot of time. therefore, I thought about the idea of Biking around this beautiful place. After looking for the best option, i was surprised to see such good reviews for Ginette’s local business. In a short notice, we got into contact and organise my visit! she was just amazing! she knew every little places around those gardens and we made our way by bike. It was great, sunny , warm! I guess my best day so far since the beginning of 2013! We even saw lots DEERS! it was just the perfect day to bring my girlfriend and Ginette was the perfect guide! I strongly recommend this local Bikes Tour! You will have a great time, for sure! It is rare these days to meet someone who enjoys so much her work and meeting new people !! Ps: we finish our wonderful day in a beautiful Pub with great food!